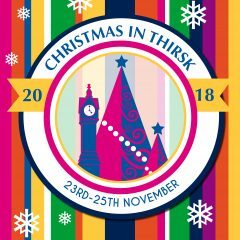 Thirsk Xmas lights look great...Thanks to the Ladies of Thirsk & District Business Association and Thirsk Christmas Fayre for organising and fundraising for the lights. Thirsk’s shopkeepers, most of whom are small, independently-owned businesses, make an effort to put on a good display. All year, the hard-working Christmas Lights Committee fundraises to ensure that the town is glows with festive lights.